Judge Jeanine Pirro wants to see the memo that House Intelligence Committee Chairman Devin Nunes wrote to the other members of the House detailing the extent and nature of the criminal activities and sedition engaged in by the Obama administration in concert with the DOJ and FBI. To get input, in as much as he can, given the restrictions in place, Rep Matt Gaetz joins her to discuss the information contained and the potential ramifications as well as the timeline and mechanisms for releasing the information to the American people. Judge Jeanine asks, “What do you mean, it highlights whose conclusions?” He replies, “Names are named. 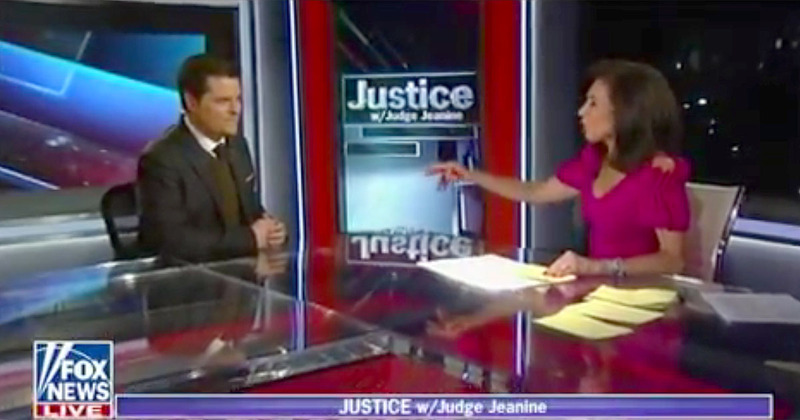 The names that we have talked about in the news associated with the corruption.” Judge Jeanine tries to get him to name some names, something that could send Mr. Gaetz to the ethics committee if she’s successful. She wasn’t, we’ll have to wait to see the report for specifics. Judge Jeanine asks when Chairman Nunes is going to schedule it for a vote. Gaetz replies that he said he wanted to hear from more members of the Congress and that 64 of them have already sent him a letter. He says he spoke with him earlier in the day and that Nunes, Goodlatte and Gowdy are working together on the timing. If this is going to come out and no backroom deals or redactions are going to be part of the product that is eventually provided to the American people, it’s best that this come out immediately and that those who have been leaders of this charge all along. Nunes, Meadows, Gaetz, Gohmert, Jordan, DeSantis, Gosar and a few others should be the ones to press the issue. Gowdy has defended Comey and the FBI against calls for an investigation and a special counsel, calling himself their most adamant defender in open hearings and interviews, acknowledging it as a position that impacted his standing with some of his GOP colleagues. Goodlatte is GOP establishment who has a history of inserting himself into situations, appearing and claiming to act on behalf of the American people only to have those claims disputed by his actions. Dance with the one who brung ya, boys. Let those who have spearheaded the production of the revelations be the ones to see it through on behalf of the American people. Well wonder if he will not release it since he might just also be involved. I am sure that hackers (bet more then one) have that info and could release it since it seems the politicians are trying to cover their asses once more. You know hackers can be both good and bad…….Sometimes they are the only way to get info out that the public should know about, and this is one of the cases. Excellent post Mr. Wells. I’ve been gone to conference for a few days, and your emails always allow me to catch up. Thanks, Kelleigh, nice to have you back. Good piece,Rick. Interlopers like Gowdy need to be moved aside. Let Nunes handle it without political interference. Agreed David, We’ve had enough of the do-nothing good talkers, nunes seems to have what it takes, and the freedom caucus can back him up. i watched that interview and WE NEED TO KNOW WHAT’S IN THOSE MEMOS, AND DOCUMENTS.